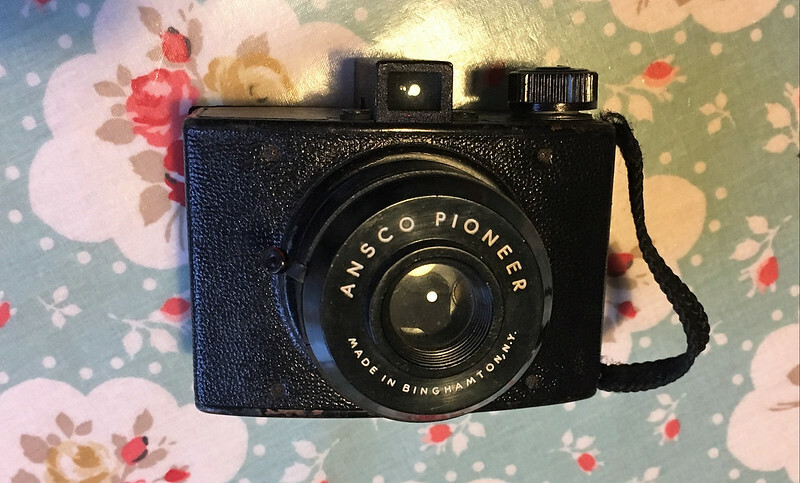 The Ansco Pioneer 20 is a vintage slice of Americana film photography and is a box camera similar in styling to the Agfa’s Clack and Click cameras. Irritatingly it uses 620 film not 120 like the Agfa’s. But hey could I mod this to work with ordinary 35mm film ? Why Kodak ? Why ? 620 film was one of Kodak’s several attempts at redefining roll film. Why ? I have no idea. The actual film strip is the same as 120 film and even the width of the backing paper is the same width as 120 film. It’s just the spindle plates are thinner and of a smaller diameter. Kodak claimed it allowed for smaller cameras although the difference is minimal. Oddly Kodak had introduce the same size film strip with 105 roll film back in 1898 for their first folder and 117 film used in the original Brownie was also the same width of film. 620 film stopped production in 1995, long before the decline of film. The consumer market had moved onto 35mm and newer formats like 110 & 126 and the Pro medium format standard was 120 or its longer 220 cousin. This creates a problem if you wanna shot one of many 620 vintage cameras. 1 & 3 sounded a bit too much like hard work. Re-spooling must be done in total darkness and given I’ve just a darkroom bag, didn’t seem to be an option. The Brownie Camera Page has an excellent page on this with How to video & step by step instructions if you must. Likewise cutting down the spools seems messy and time-consuming as this handy post from Lomography describes. Re-rolled 620 is a boutique niche product. FPP sell range in the US but by the time I add shipping on top of $10+ a roll it gets a bit too costly. Expired film is likely to be at least 2 decades expired too. Hmm… So could I use 35mm film ? …. 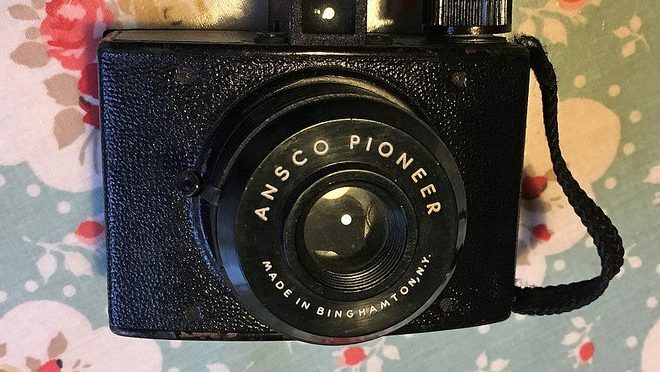 The Ansco Pioneer 20 is a simple box camera. In curious twist of fate it evolved from the Agfa Chief (Ansco and Agfa US had merged in 1928). When the US entered WWII, Agfa Ansco was taken under US ownership and camera production ceased. Although some war made Chief were rebadged as Ansco Pioneer, Agfa Pioneer or Ansco Chief. Pioneer production resumed in 1947 and ended ’53. Oddly a year later Agfa would launch the more famous Agfa Clack which appear to me to be an evolution of the Chief & Pioneer . The Post war Pioneer is a fixed everything camera unlike the earlier versions (these varied with some offering optional bulb setting, scale focus and/or yellow filter). There are 2 versions the Pioneer-20 (PB20) for 620 film and Pioneer-16 (PB16) for wider 616 film. I can’t find the simple lens’ focal length for certain but from measurement I’d say around 90mm. The aperture is quoted in Popular Photography ‘s 1950 Camera Directory as f/14 and shutter speed of 1/50. There’s a mount point for a flashbulb holder. This tantalising seems to be the same pin width as the Diana F+ but you’d sadly need longer flash poles to mount it. Like the Clack and Click, the film plane is curved. It’s a quite a dinky little camera, with nice curves, The viewfinder is small and the barrel mounted shutter switch does put it at risk of shake. Given the relative ease of using 35mm film in 120 cameras like the Brownie No2 or the Bencini Koroll 24S, let’s give it a go. Bad idea here for 2 reasons. Firstly the fitting in the Pioneer at least is much narrower making it harder to get the 35mm cartridges in. Secondly the film plane is curved so you’ll end up the centre of the image off the focal plane . Before loading with film I used the same trick I described in my 35mm in a Bencini Koroll Post and the same trick in my Brownie. Problem was 620 rolls are narrower than 120 so it was a really tight squeeze. I managed it but it’s not something you’d wanna repeat. Loading is more like the brownie than the Koroll. After that things were okay and was able to load and use. I picked a roll of Ferrania Solaris that would work out as an effective 100 ISO and managed to get a pretty Sunday day in Glasgow to shoot. I got those kind folk at Digital Photo Express in Carlisle to process and scan for me. I wasn’t expecting much due to your failure to remember the curved Film plane. However the results were better than you might think. It’s a game of 2 halves here. 5-15m it’s the first time I’ve shot a camera where the results are sharper on the edge. Things really are soft centrally as you’d expect as I’d stuffed up. However Get back from your target and things change.The 35mm film sits about 5mm in front of the intended focal point. Now this might sound like game over. However if you know anything about optics it isn’t. It just means the focal plane of the film is actually focused on a further away object. This means the camera actually does okay at distance shots centrally (the edges soften obviously). Whilst you can find loads about this camera from a historical perspective, there’s next to no new reviews. The only one I can find is FPP’s video review of the Pioneer-16. I guess ‘cos of the lack of film. Having a glance at the shots on Flickr taken on this, I’m struck if loaded normally the camera is reasonable in 5-15m range but pretty rubbish for long shots. The edges do soften and some vignetting is evident. It’s like a 620 version of the Olympus Trip 500 but without the practicalities and colour saturation effect. So is it worth the effort ? Honesty, even if you’re a fan of heroic efforts or willing to roll your own 620 film, no it isn’t. If shot correctly you’ll get nice big 6×9 frames that are poor in quality. Buy a Agfa Clack if you value the soft big frames and at least you can use cheap 120 film. Personally I’d go for the Agfa Click, it’s stylistically similar but better optically and will give you more shots a roll with a 6×6 frame mask. Kodak Cresta series of cameras also may have give you similar lo-fi medium frame fun. Modding it is a risk as it’s just too tight. 620 was a boondoggle, full stop. One of my most lovely cameras, a Kodak Monitor, takes that infernal film size. Therefore, it hardly gets used.